2018 Key West 230BR Bay Boat, Yamaha F200XB, Sidewall Colors Ocean Blue,, Rub Rail White / SS Rub Rail / LED nav lights, Hard Top Hard Top radiobx,Cargo Net, LEDs, Rod Holders w/POWDERCOAT, Top Accessories Accent Colored Hard Top, Helm Seating Configuration 6..1 Prem Independent Flip bolster LeanPost w/backrest,rod holders w/POWDERCOAT, Helm Seating Configuration 6..2 w/ 94 Qt Cooler, Helm Seating Configuration 8 Console Footrest/ Storage-Recommended with Premium LP, Helm Seating Configuration 8.1 Led Lights for Footrest, Seating Casting Seat Bases (2), Seating Casting Seat w/ post only, Canvas Color Black (Standard), Canvas T-Top Spray Shield (Black), Electronics Polk Bluetooth Stereo and MP3 port w/4 Speakers, electronics - Lights Interior LED lights (Blue), Electronics - Lights Lumishore Underwater Lights, High Pressure Wash down (pump), Molded Swim Platform with Ladder, Additional Casting Seat for a Total of (2), Includes Trailer. Big Brother to the wildly successful 210BR this new addition shares the tremendous rod storage capability of the 210, and the added length plus beam provides lots more open cockpit space. 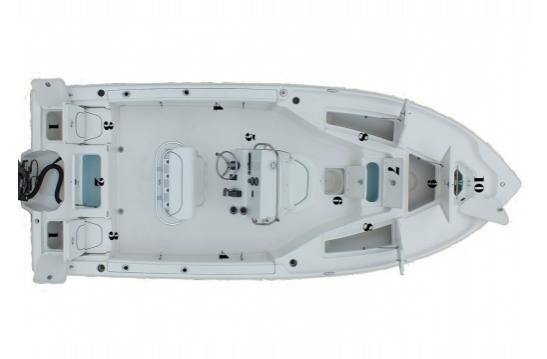 Combine this with added depth both inside and out and we have a great inshore boat with reasonable open water capability. Check one out soon at a dealer near you. Boat pictured is boat number one and features several options. The unique integrated transom jack set back allows for both standard 25" engines as well as a 20" high performance outboard combined with a hydraulic jack for enhanced shallow water operation and improved high speed handling.